11 Nov – Former prime minister Tony Abbott’s sister, Sydney councillor Christine Forster, had her “favourite jacket” ripped as she tried to enter a Liberal Party fundraiser surrounded by hundreds of Manus Island detention protesters. Riot police formed a human chain to shield guests arriving for a Liberal Party fundraiser from several hundred Manus Island protesters who had formed outside the Friday night event which was also attended by Tony Abbott and Immigration Minister Peter Dutton. Cr Forster had to be helped through the crowds by police and had her jacket torn in the crossfire. “Basically a melee broke out, it was a riot,” she said. “It was an extraordinary situation, it was very unpleasant, it was dangerous for everybody, it was an aggressive, awful, scary situation. Cr Forster said people should able to walk into an event “unmolested, unassaulted and unattacked”. “It was a very unpleasant, unnecessary, dangerous situation that those people put everybody in,” she said. “It was a situation that I have never been in and I would never choose to be in ever again. It’s my favourite jacket and it’s shredded sadly and it was shredded off me from behind. The protesters were calling for the Immigration Minster to restore services to the now-closed Manus Island detention centre and bring the remaining asylum seekers to Australia. The Australian Government had officially closed the detention centre on the Papua New Guinea Island on October 31. On Friday, refugees and asylum seekers on Manus island told the ABC they were “extremely scared” as workers tore down fences around the compound. The Papua New Guinea Government also put up a notice warning “force may be used to relocate those who refuse to move voluntarily”. Protesters outside the Liberal Party event at Australian Technology Park in Eveleigh spoke on loudspeakers and harassed and berated guests, with police forced to intervene several times. Hundreds of protesters came with whistles, pots and pans, shouting “Abbott, Dutton, blood on your hands” and “Shame on you” to the guests who made their way through through the crowd. Activist Lily Campbell said she was protesting because Mr Dutton and Mr Abbott were “responsible for the siege on Manus Island right now”. “I think every refugee should be brought here and should be granted asylum in Australia,” she said. “I can’t believe the state it’s got to on Manus Island,” another protester, Margaret Walters, said. Hundreds of people also marched through central Melbourne calling on the Federal Government to assist refugees at the Manus Island detention centre. The rally began at the State Library before demonstrators marched along Swanston Street. 25 March 2017 – Protesters have camped outside Villawood detention centre overnight despite the arrest of four people yesterday. The riot squad was called in at 3.30pm after an initial group of 30 protesters grew to around 70 and began blocking traffic on Birmingham Road. Police said the group, who were gathered at the detention centre to protest the deportation of a 60-year-old Iraqi man identified only as Saeed, began to impede traffic in and out of the facility. “This is kind the kind of horrible rise of racism we’re trying to fight here,” Josh Lees, a protester from the Refugee Action Coalition, said. Protesters allegedly ignored several move-on directions from police and tried to break a police line, which was formed to allow traffic flow into the facility, just before 7.30pm. Two men and two women were subsequently arrested. The protesters allegedly tried to break the police line. The two women, aged 25 and 29, were later released for breaching the peace. An 18-year-old man, who was chased down a storm drain before being arrested, was charged with assaulting police and resisting arrest. He was granted bail and is expected to front court on April 12. A 25-year-old man was issued with a Field Court Attendance Notice for assaulting police. A police officer suffered minor injuries during the protest. A small group of demonstrators camped out overnight at the detention centre to continue the protest. One protester said they were “physically” trying to stop the deportation of the man. “We’re trying to physically prevent a deportation of man who, if he is deported, his life is at risk,” she said. The Department of Immigration and Border Protection today confirmed Saeed will be deported. 8 June – Police in Papua New Guinea fired gunshots Wednesday to quell a student protest demanding the prime minister’s resignation, the government said. The country’s police commissioner said nearly two dozen people were injured, but denied reports that as many as four people were killed. Students in the South Pacific nation have been demanding for weeks that Prime Minister Peter O’Neill resign because of alleged corruption and mismanagement. Australian Foreign Minister Julie Bishop said she had been advised by the Australian embassy that police shot students in Port Moresby, the capital, as hundreds prepared to march from the University of Papua New Guinea to Parliament. Australian Broadcasting Corp. reported that a Papua New Guinea lawmaker told Parliament that four students had been killed and seven wounded. 25 May – A man is expected to be charged over the vandalism of the police memorial in Sydney’s Domain that has been defaced twice in four days. The wall displays the names of dozens of New South Wales police officers who lost their lives on the job, and is the site of the state’s annual National Police Remembrance Day service in September. 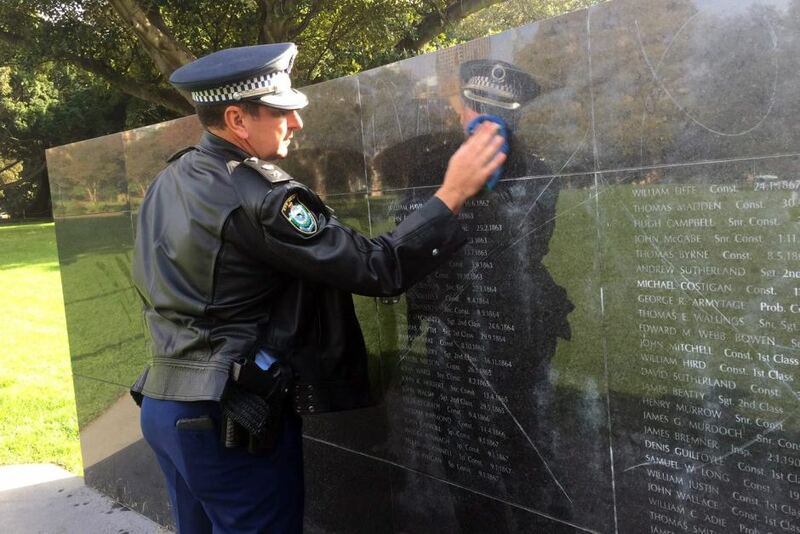 On Friday the NSW Police Wall of Remembrance was marked with scratches and abusive messages. 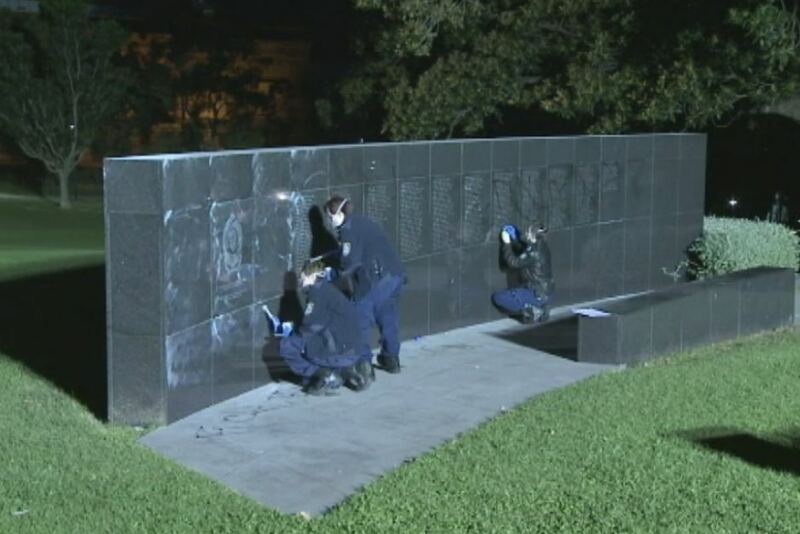 About 11.15pm, officers found the wall had been desecrated further, with black graffiti on the panels and the ground in front of the memorial. Police believe both incidents are linked. Earlier in the evening, the 30-year-old man believed to be responsible was arrested near the pedestrian overpass at The Domain following information from the public. Police said the man resisted arrest and smashed the rear window of a police car as he was being taken to Day Street Police Station. He was then taken to St Vincent’s Hospital to be treated for a possible medical condition about 11:00pm. Officers said they expected to charge the man over both incidents once the 30-year-old was released from hospital. On Saturday, police said the panels would need to be deconstructed and be professionally cleaned. 21 May – A ‘sacred’ memorial honouring NSW police who died on the job may have to be removed after a senseless and insulting desecration, police say. NSW Police Commissioner Andrew Scipione has made a personal plea seeking justice over the vandalism of the Wall of Remembrance in Sydney’s Domain after it was scratched with glass or a rock by a man on Friday night. ‘There is no more important or sacred place in the country to the NSW Police Force, than this memorial,’ he said on Saturday, joining police and community members in expressing their disgust. ‘The person who has done this knows who they are. I am appalled and saddened that the names of our state’s heroes have been desecrated,’ Commissioner Scipione said. Earlier, Sydney City Local Area Commander David Donohue said the memorial would likely need to be deconstructed and professionally polished, and that police were considering installing security cameras at the site to protect it in future. They’ve already released CCTV footage of the man they believe was involved, and have collected fingerprint evidence. Footage shows a man who ‘walked with a distinctive swagger’ who was also seen falling off his skateboard into oncoming traffic the same afternoon, Supt Donohue said. ‘It’s only a matter of time until we apprehend this person,’ he said. The man faces a malignant damage charge and up to 15 years in jail. 7 May – Police have clashed with revellers at a wild house party in Sydney’s south overnight. A police officer was hospitalised and a teenager has been charged following the out-of-control party in a vacant house at Gymea on Friday night. Shortly before 8pm officers attached to Sutherland Local Area Command were called to the property on View Street after complaints about the party, police said. 8 April – Police have used capsicum spray on protesters outside a Liberal Party dinner to mark the 20th anniversary of the election of John Howard’s government. However, Prime Minister Malcolm Turnbull is suspected to have avoided the skirmish in Melbourne’s Docklands by arriving by boat and entering the back of Shed 14 behind a police line. About 150 people gathered outside the Central Pier function venue about 6pm on Friday to protest the federal government’s changes to higher education and the treatment of asylum seekers. The demonstrators scuffled with police, including about 50 uniformed officers, as well as five mounted police and some Australian Federal Police. The protesters yelled “scum” and “shame” at guests and jostled them as they arrived at the venue and were ushered around the rear of the venue by security guards. Some of the building’s windows were broken, with officers using pepper spray on about 20 people, including an ABC cameraman.